getTV now welcomes guest bloggers to the website each month to write about their favorite films and shows. Our guest blogger for July is the passionate Aurora Bugallo, who writes about her love of classic film and television for her own popular site Once Upon A Screen and on social media as @CitizenScreen. I first saw Jason And The Argonauts when I was eight. It was a summer afternoon and, like most days, my TV watching was at the mercy of my older brother who held the reigns in such things. Even then I loved Cary Grant, Katharine Hepburn, and Fred and Ginger movies, but my brother preferred blood and guts. On the worst days I’d be subjected to wrestling, but on the best he’d inadvertently introduce me to magical movies. On that particular Saturday I was as reluctant an audience as ever, but the hero’s journey that unfolded would fascinate me all of my life. It was a fantasy adventure that could not be bettered in all of the movie watching I would do in the decades that followed. The Greek myth of Jason and his search for the Golden Fleece is one of the oldest myths of a hero’s quest, and it makes for one of the finest fantasy adventure movies ever made. Intent on avenging the murder of his entire family and regaining the throne of Thessaly, Jason sets forth to find the magical Golden Fleece. He is encouraged by the conniving murderer, Pelias, who hopes Jason will die during the quest and thereby thwart the prophesy that he will reclaim the throne. Protected by the goddess Hera, Jason sets his sights on Colchis, the island at the end of the world where the Golden Fleece lies. Jason boards his ship The Argo accompanied by a crew made up of the bravest men in all of Greece who competed for the honor. Jason’s quest comes vividly to life in Jason And The Argonauts, which is likely to fascinate the child in all of us whether on its first or tenth viewing. Don Chaffey’s direction is spirited, the script by Jan Reed and Beverly Cross is strong and (mostly) stays true to the myth, and all is supported by Bernard Herrmann’s inspired affecting music. The colorful cast made up of mostly English character actors, who look at home in period costumes and perform with zeal. Particularly memorable turns are delivered by Todd Armstrong as Jason, a contract player at Columbia at the time, Nancy Kovack as Medea, and Honor Blackman and Niall MacGinnis as Hera and Zeus, the gods who enjoy playing chess with humanity. All of their efforts make for an enjoyable fantasy adventure, but they pale in comparison to what makes Jason And The Argonauts worth repeated viewings - the work of special effects genius Ray Harryhausen. Harryhausen is credited as both creator of special visual effects and as one of the producers of Jason And The Argonauts along with Charles H. Schneer with whom he collaborated on nine movies. This was also Harryhausen’s favorite, his first foray into Greek Mythology, which he described as "a perfect mate for stop motion animation because the philosophy lends itself to fantastic creatures we’ve never seen before, they’re built into the original story.” As such, the journey as depicted in the movie takes our hero to regions of supernatural wonders, to encounter fabulous forces, and win decisive victories against the best stop motion animation has ever offered. The supernatural and the fabulous forces are the result of Harryhausen’s work. First we see the colossus Talos, a bronze statue who guards Crete and the riches of the gods stored there. A misdeed by Hercules brings the statue to life, and the Argonauts must try to escape Crete with life and limb intact. I vividly remember the thrill I felt the first time I saw the awakening of Talos, my introduction to Ray Harryhausen’s brand of movie magic. Eight-year-old me still bites her nails as the giant figure slowly turns its head to see Hercules run from the temple with guarded jewel in his hand. Talos is just the beginning of the magic in this story, but he leaves quite an impression. If you’re not impressed by the time the hydra appears in Jason And The Argonauts, you will be when you see the film’s climactic skeleton battle, which is the stuff of legend. An army of the dead rises out of the ground with shield and sword in hand. They swarm battle-ready and our hero is forced to face an unimaginable foe that is not afraid to die. My goodness. I still get chills as I watch the sequence - it is Harryhausen’s most famous and the one many believe to be his masterpiece. This sequence is also the best example of his discipline, the legend of which is matched only by his talent. 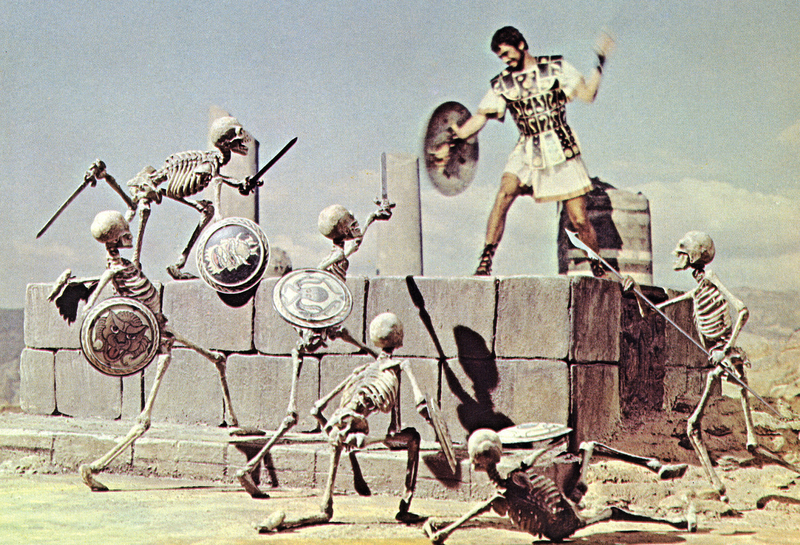 Harryhausen discussed that he was only able to animate about half a second of film a day for the skeleton battle, which entailed moving skeletal appendages one at a time, thirty five times for every frame of film. The animator spent so much time with the skeletons - four and a half months - that he referred to them as his best friends. Harryhausen was more modest about his achievements in comparison to how enthusiastically his admirers offer him praise. When asked to analyze his work the legend would usually say something like, “I set out to make good entertainment and when three generations of family members come up to me and say ‘You made our childhood,’ I think I succeeded.” I can attest to that because on a summer afternoon I saw Talos turn his head and my childhood was made. Join me to watch Jason And The Argonauts preceded by The Golden Voyage Of Sinbad on July 14 on getTV. The evening dedicated to Ray Harryhausen starts 8 pm ET/5 pm PT.